Yellow ware is an item that is starting to achieve a growing amount of respect in the collecting world. The increasing popularity and demand have brought many new pieces to the surface, and education has enlightened us to be able to identify previously unidentifieable pieces. This book represents many of these and other pieces, many never before pictured, in beautiful full color with a description and price range for each. Also included is new information on potteries and potters' marks, as well as a thorough glossary. 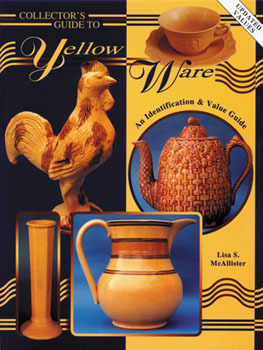 This book is a must for any collector of yellow ware - not only is it an excellent ID and Value guide, but it presents new information for the first time in print.